My interest in public health nutrition has always centered on children living in low-resource settings. Vulnerable populations in many African countries are often found in rural and poor, underserved urban areas. These children, like all others, need to be well-nourished to be healthy and to attain their growth and intellectual potential. In an attempt to improve the welfare of vulnerable children, most governments in Africa have introduced some kind of a school feeding program (SFP) that provides either rations, meals and/or snacks to school-aged children in poor communities. Under the leadership of the African Union, New Partnership for Africa’s Development, the home-grown school feeding program (HGSF) was crafted to be used as a channel for achieving the Millennium Development goals (specifically 2 and 3) and other local targets. The HGSF was initially launched in 12 pilot countries namely Cote D’Ivoire, Ghana, Kenya, Mali, Nigeria, Tanzania, Ethiopia, Malawi, Mozambique, Senegal, Uganda, and Zambia. The Ghana school feeding program (GSFP) introduced in 2005, adopted the “home-grown” approach as a means of not only addressing nutrition and education issues, but also improving the lives of local smallholder farming families. The aim of the GSFP is to provide one hot nutritious meal to kindergarten and primary school children in poor communities. This is to help address short-term hunger and malnutrition, improve the enrollment, attendance and retention in schools, and better the livelihoods of smallholder famers. The premise of the school feeding intervention is that the provision of nutritionally adequate meals will contribute to optimal nourishment of school children. Better-nourished children will have better cognitive development, pay more attention in class, and have the good health needed to facilitate learning. Also, in-school meals will prevent the need for children to leave the school to find food and also act as an incentive to increase school attendance. Procuring food for school meals from smallholder farmers locally will improve local agricultural economy and livelihoods of farming families. As expected for a nationwide government program, the implementation of the GSFP involves key actors from different sectors. The Ministry of Local Government and Rural Development was responsible for program oversight from 2005-2015 but has recently been replaced by the Ministry of Gender, Children, and Social Protection. The ministry runs the program through the GSFP National Secretariat and collaborates with the Ministry of Food and Agriculture, the Ministry of Finance, Ministry of Health, Ministry of Education and the Ghana Education Service. Located in the capital city Accra, the national Secretariat is responsible for the coordination and management of the program. It provides support to the implementation structures at the GSFP regional1 secretariat and the desk officers2 at the district3 assembly levels. The Secretariat employs a decentralized procurement process where caterers are recruited through a tendering process that requires them to be local residents with the capacity to self-finance procurement of food produce. Typically, caterers are responsible for feeding a maximum of three schools, not exceeding a total enrolment of 400 pupils and are paid 80 pesewas (0.25 cents) per meal provided to a child. Cooks assist caterers with the preparation and serving of school meals and the decision on the number of cooks to hire is at the caterer’s discretion. At the school level, the school implementation committee made up of the headteacher (principal), parent, student representatives, school health and education program (SHEP) coordinator ensure the smooth running of the program. Caterers are expected to follow a weekly menu endorsed by the district and school implementation committees. Although meals may vary by region and seasonality, they are made from similar food produce. Typically, carbohydrates sources include rice, maize, cassava, plantain, yams. Beans, fish or fish powder are the main protein source foods, and vegetable oil, palm oil, and shea butter are the common fats used. Vegetables like okro, local green leafy vegetables (“edeme”, “nkontomire”), tomato and onions are used in sauces and soups. According to the caterers, fruits are seldom served because they can barely provide a nutritious meal with 80 pesewas. Successful and sustainable programs rely on effective monitoring and evaluation (M&E) to generate the evidence needed for achievement of goals and policy development. Previous independent evaluations of the GSFP showed that assessment of nutritional quality of the GSFP meals was based on anecdotal reports by observers who had no objective measures of meal adequacy. Furthermore, the available M&E reports relied solely on word-of-mouth of farmers to assess the improvement in their livelihoods. In view of these gaps, the GSFP in collaboration with its stakeholders have developed an M&E system with new tools to help monitor the program successfully. 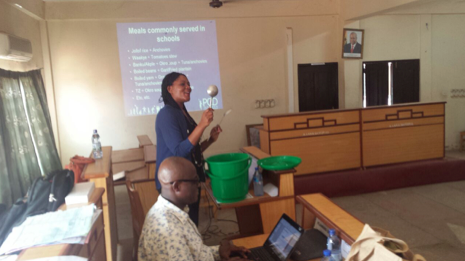 The monitoring tools include the daily feeding monitoring tool for caterers, procurement form for caterers, daily feeding monitoring tool for headteachers (principal), the school term monitoring tool for headteachers, and the sanitation and hygiene tool. The monitoring tool for caterers collects daily information on type of meal cooked, number of pupils fed, ingredients (grouped under proteins, carbohydrates, fats) and the amounts used in meal preparation. The procurement form is to be used by caterers to record food purchases, seller’s information (if available), and the source of food commodity (district, region, outside). The headteachers’ tool is designed to capture daily information on meals prepared and portions of meal given to each child. In addition, the school-term monitoring tool is used by the headteacher at the end of the school term to record pupil enrolment, drop outs, and the number of meetings by the school implementation team. The sanitation and hygiene forms, as the name suggests, is used by a regional monitoring personnel as an observation checklist to record the availability and maintenance of sanitation facilities, drinking water, and hand washing station in a GSFP beneficiary school. Through the IMMANA fellowship, I am conducting a pilot study to determine the feasibility of using the new tools in monitoring the nutritional quality of the school meals and the link of the GSFP to local agriculture. The feasibility study will be conducted in collaboration with the GSFP M&E team. The GSFP National Secretariat has shown interest from the start and continues to be keen on collaborating to see my proposed research completed. This study will serve as a “mini-pilot” of the new tools before the new tools are rolled out. Six districts (two per region) will be selected to represent the northern, middle, and coastal belts of Ghana (map shown below). Three beneficiary communities/schools will be selected per district in every region. The M&E personnel (including the head teacher, SHEP coordinator, caterer, district desk officer for GSFP, and regional monitors) from the selected districts and regions will be trained to use the new monitoring tools as part of daily activities for a school term. At this point in our timeline, we have successfully completed trainings in all selected districts and the new monitoring tools have been used for the first week in monitoring GSFP activities in the selected schools. All monitoring personnel in our selected communities were present for the trainings. There was a general consensus that the program needs a rigorous monitoring system and tools to make it sustainable. At these trainings, we learned that caterers sometimes compromise on the nutritional quality of meals when payments are delayed. On the operations plan of the GSFP, caterers are required to purchase 80% of food commodities locally to help achieve the objective of boosting local agricultural production. However, this has proved difficult because of the delays in caterer payment. Small holder farmers are unwilling to trade with caterers because of the uncertain payment terms. When my fellowship ends in October 2016, I expect to have a report detailing how well the new tools performed in monitoring the nutritional quality of the GSFP meals and the link between GSFP and local agriculture. I will be disseminating findings from the study to the GSFP M&E team and will share with them recommendations to improve the effectiveness of the new tools. This study will inform the GSFP on what needs to be amended on their tools before rolling out. In addition, information from the qualitative data will inform the M&E team of the experiences of monitoring personnel on the ground. Future GSFP M&E trainings and policy can be tailored to address the problems identified. 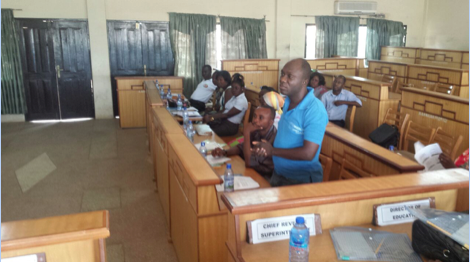 1Region: There are ten regions in Ghana and each region has a regional coordinator and regional monitoring personnel who oversee GSFP implementation in their region. 2District desk officer: Staff of the district assemblies designated by the assemblies to serve as the link between the district assembly and the GSFP National Secretariat. Districts in Ghana are second-level government administrative subdivisions, below the level of the region. 3District Assembly: the basic unit of government administration responsible for administrative and developmental decision-making in the district.